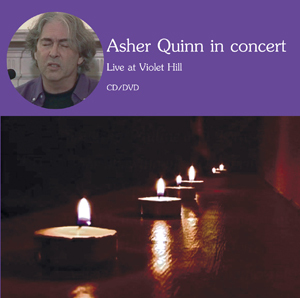 This is a relatively recent concert (2008) filmed at a small healing centre in London. Asher sings acoustically, with just a keyboard, guitar and mouth-organ to a rapt full house! As well as performing some of his own best-loved vocal ballads, Asher also introduces some traditional songs, and powerful renditions of mystically-tinged classics by the likes of Leonard Cohen and Bob Dylan. There is also much gentle humour as Asher chats to the audience. The DVD makes it a collector's item. It's great to see you now, also by singing. This is a wonderful DVD. If there are troubles in the family I give in your DVD and everyone 'comes down'. Love and light to your family. Thanks for your wonderful DVD 'live'! We can see now all your emotions when you sing! To watch you perform makes my heart go faster, it is just like I thought; you sing with all your heart and soul. It looks like the music even comes out of your toes. More of the same, please! That is awesome, God-touched work. Love you. What a wonderful evening. Thank you for putting yourself out there for us all, and sharing the contents of your heart. I felt swept away at times with the beauty of your words and music.